This idea dates back to the Russians in the early 1970s. The surface of Venus is far too hot, and the atmosphere too dense, for Earth life. However, our air is a lifting gas on Venus with about half the lifting power of helium on Earth. A habitat filled with normal air will float high in the dense Venus atmosphere, The atmospheric pressure there is the same as Earth sea level (1 bar). Temperatures are perfect for Earth life too, just over 0°C. Also, just as weather balloons naturally rise to their operating level high in our atmosphere - so it works in the same way for our habitats on Venus. They float at a level where the pressure is equal inside and out, and can be of light construction. It is arguably the most hospitable region for humanity in our solar system, outside of Earth itself. Venus cloud colony habitats can draw on our experience of buildings for the Earth surface, especially Buckminster fuller type lightweight domes. In this way, humans perhaps could colonize floating colonies just at the tops of the clouds of Venus. The surface of Venus is harsh in the extreme, way outside the range of habitability for any known form of Earth life. However, the environment at the cloud tops is surprisingly habitable. original article (in Russian) - and forum discussion of the article - includes rough translation (I think anyway), probably by non native English speaker. I mentioned this idea in my Trouble with Terraforming Mars, but not in much detail. Since then I've found that, though there are only two recent peer reviewed articles on the subject, they have generated a lot of interest, with an active discussion of these ideas currently in forum posts in various places on the web, which have also suggested various new ideas not mentioned in the original articles. Here is a demo of a soap bubbles filled with ordinary air floating on carbon dioxide, the basis for the Venus cloud colony ideas. Mars has often been suggested as a second home for humanity. But it might not work as well as you'd hope, see my Trouble with Terraforming Mars, and Ten Reasons NOT to Live on Mars, Great Place to Explore. The Moon is a good first choice because it is so close to Earth for resupply and emergency issues. See If Mars Is For Hardy Explorers Only, Where Is The Best Place In The Solar System For First Time Colonists? Venus though has surprisingly many advantages, and is worth looking at seriously I think. These habitats could be of really light construction, maybe tensegrity structures - or Buckminster fuller domes or some such. A slightly higher internal pressure would be useful to keep the fabric tight - but you don't have to do this either. The Venusian cloud cities could use Tensegrity structures, or else Buckminster Fuller domes - like this one - to achieve lightweight but strong construction. Earth normal air inside would act as a lifting gas to let the colonies float naturally in the habitable region of the atmosphere. All you have to do is to make sure that the nitrogen and oxygen inside the habitat doesn't diffuse out into the Venus atmosphere - and then it will float at just the right level for an Earth normal atmospheric pressure inside and out. For instance normal glass such as for house windows would be fine also for outside windows of the structure - or lighter plastics. The only thing is, their exteriors have to be acid resistant to resist the concentrated sulfuric acid in the Venusian cloud droplets. This is a major advantage over space habs such as the ISS, or Moon colonies and so on. These have to be massively engineered to withstand ten tonnes per square meter of outwards pressure. That's why they are built of cylinders and spheres mainly, and is also why they have few windows, and their windows are made of such thick strong glass or multiple layers of glass. This image shows the ESA Columba module docked to the ISS. You can see the heavy construction, and cylindrical style habitats with few windows. This is necessary because the structures have to withstand tons of pressure from inside, because of the vacuum of space outside the habitat. Venus cloud colony habitats, by contrast, can be large, lightweight, and airy and with many windows. Also, we have much less experience of space habitat type buildings, just the ISS so far, as well as construction of spaceships of course, such as Apollo, etc. 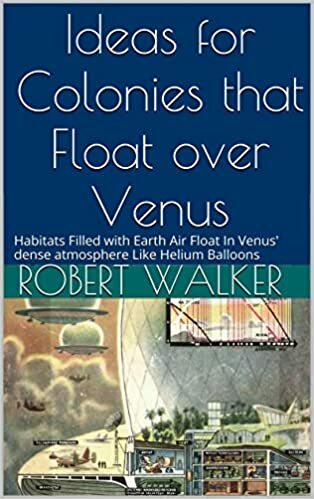 Venus cloud colony habitats can draw on our experience of buildings for the Earth surface, especially Buckminster fuller type lightweight domes - and experience of building dirigibles. For the first Venus habs, you could use a Bigelow type inflatable habitat - but far lighter than their space habs. Also, you get much more living space for your inhabitants for the same weight of habitat. Bigelow's commercial space station plan - made of inflatable modules. The first Bigelow inflatable module is due to be docked with the ISS in 2015. At a later stage they plan to build an entire space station of inflatable habitats, as in this image. The habitat inflates and gets larger when it is deployed. A similar inflatable habitat idea could work for a Venus cloud colony in early stages of colonization, but could be far lighter or provide a far larger living area for the same weight. There is no need to wear pressurized spacesuits either as the outside atmosphere is already at the right pressure. Spacesuits are amazingly clumsy in a vacuum because of the internal pressure. It's been described as like trying to work with your fingers inside a pressurized hose. They are also not as easily reusable as you might guess from science fiction stories. Modern spacesuits take ages to put on and take off, is a long process (on the ISS the process of donning a spacesuit starts the previous day with lowering of pressure of the entire ISS). Space suits like this one are very clumsy in use, because the high pressure inside makes the gloves hard to work with. In a Venus cloud colony you would not need a pressurized space suit, just protection from acid. Your gloves could be lightweight and flexible, perhaps more like gardening gloves. In a Venus cloud colony, if you go outside your habitat you need protection from the acid, and aqualung type breather apparatus. However, your clothes and gloves don't need to be pressurized and would be as easy to use as normal work gloves, e.g. gardening gloves. So - that's one of the plus points, there are many more. There are many challenges and disadvantages also, though sometimes with surprising solutions to the problems. 2. Stable temperatures, the upper cloud level stays at much the same temperature day round and year round. The main reason ISS deteriorates with design life of 30 years is because of cracks from the expansion and contraction due to huge temperature differences between sun and shade as it turns - the same stresses would also apply of course to lunar habs until insulated by thick layer of regolith. 3. Nitrogen from the atmosphere - this is significant since nitrogen is rare in the inner solar system, and essential to life. We also need it as a buffer gas in the atmosphere unless you live at reduced pressures like astronauts in a spacesuit and the early Gemini astronauts, about a third of full atmospheric pressure. Oxygen at full Earth atmospheric pressure is poisonous to humans. See Oxygen Toxicity. Carbon dioxide can't be used as a buffer gas, because it is poisonous to humans at low concentrations of 1% or so. Other gases such as argon could be used but are also rare. There is some nitrogen (and argon) in the Mars atmosphere, but nitrogen is rare on Mars at least on the surface. Most space habitats would need to import nitrogen from somewhere. It is available in some meteorites. Venus has 3 bars of nitrogen compared with 0.78 bars of nitrogen for Earth. This means that even if the entire atmosphere was filled with cloud cities, with populations greater than the Earth, they would never run out of nitrogen for plants and for buffer gas for breathing. This is a major plus point as nitrogen is generally in short supply in most locations in the solar system (some meteorites are nitrogen rich, but this is rare). Nitrogen is rare in the inner solar system. 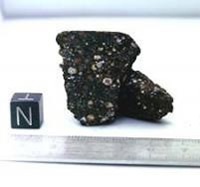 This carbonaceous meteorite is rich in nitrogen. So it may be possible to find enough in space for habitats to use. 4. CO2 is available also - and no need to extract the CO2 from a near vacuum, as you have to do for Mars. 5. It also has a fair bit of water vapour, enough for the cloud cities to use. Unfortunately at the cloud top levels of Venus this is all bound up in extremely concentrated sulfuric acid, with pH less than 0, similar to battery acid. This is perhaps the main challenge - I will look at that under disadvantages. We need some way to get the water out of the concentrated sulfuric acid, by biological or chemical methods, or through use of solar energy. Do that and you have all the ingredients to grow plants and trees apart from some trace elements. 6. Ability to grow construction materials from the atmosphere for new habitats. Once you have water and trace elements you can grow trees. Since trees are 90% either water or CO2, then most of the mass of the trees comes directly from the atmosphere. As the colonies expand, much of the construction material would be wood and fabrics grown almost entirely from materials in the atmosphere of Venus. 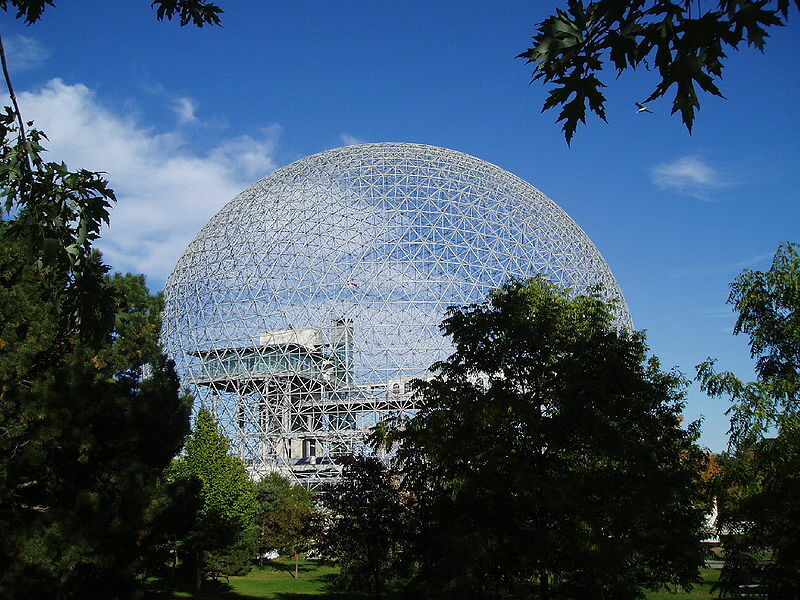 Wood and plastic are easily strong enough to construct the lightweight habitats needed for Venus via Buckminster Fuller domes, tensegrity structures, and so forth. 90% of the mass of a tree comes from water or CO2, See this video by Richard Feynmann - the famous nobel laureate physicist. The missing ingredients such as trace elements for plants, soil for them to grow in (or machinery for hydroponics), etc can come from Earth initially, later by space mining. 90% of the mass of these trees comes from the CO2 in the atmosphere or from water. Similarly we could get 90% of the mass of trees and cotton or other plants for materials in the Venus cloud colonies from the atmosphere. This could be used to build new habitats. 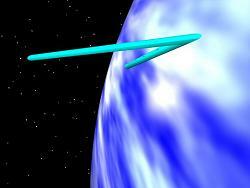 Artist impression of Apollo re-entry. The same method can be used in the Venus upper atmosphere, no need for retro-rockets. No need for retro rockets. Also there is no hard surface to impact on, so no risk of collision with the surface. Finally you would also inflate balloons with lifting gas as it slows down, so that your supplies level out at the right level to be easy to retrieve from the habitats. This artist's impression shows the European Venus Explorer - a proposed ESA mission to Venus (submitted but not approved). The Russian Vega probes in 1985 would have looked similar. 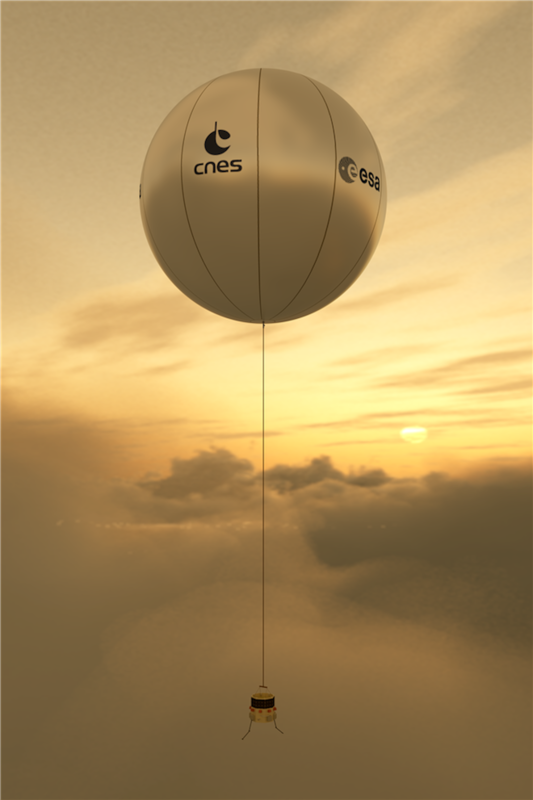 Larger scale missions supplying materials to a Venus Cloud Colony could use inflated balloons after atmospheric entry to float at the desired level for easy retrieval of the materials by the cloud colony. This shows a titanium helium tank for from the Russian Salyut 7-Cosmos 1686 (Kosmos 1686) spacecraft assembly, which went out of control and fell to Earth as a fireball, 3 to 4 years earlier than expected, in 1991. 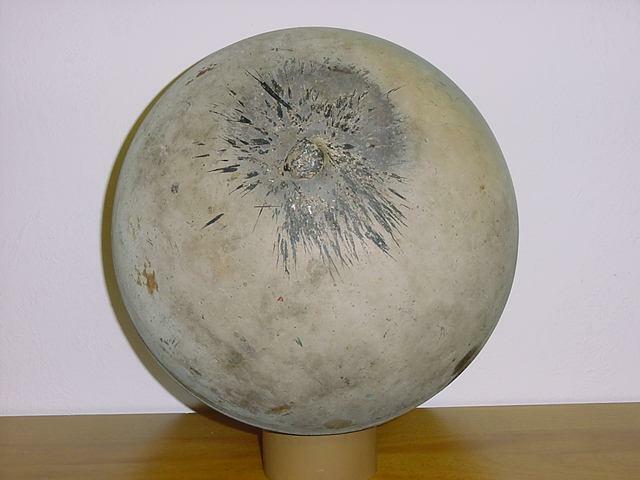 Because it is spherical and made of titanium it landed more or less intact with some ablation features. Supplies for Venus cloud colonies, if enclosed in titanium spheres with the interior adjusted to the right buoyancy for the habitats, would not need balloons or parachute. They just need to be fired on a trajectory to take them into the Venus atmosphere at the right point. They would survive atmospheric entry intact all the way to the habitat level. One way or the other, it would be far easier to export materials to the cloud colonies than to the Moon or Mars. If time is of no concern, if you take the long view, then using gravity assists on the Interplanetary Super Highway you can send material to Venus from anywhere in the solar system. So would be easy to send ice for water for the habitats - you would send it to the colonies in aeroshells and with parachutes and so would have no need to worry about it getting ablated into the atmosphere. Interplanetary Super Highway - Artist's impression - NASA - if you are in no hurry, then by use of gravity assists you can send materials from almost anywhere in the solar system to almost anywhere else, with almost no delta v except for whatever is needed to escape from gravitational wells such as planetary surfaces. 8. Materials are also available from the surface of Venus. As the colonies become more independent, you can trawl the surface, much like trawling an ocean bed. You don't need to send complex sensitive machines down there. Instead you could fly down as far as is safe in airships - remote controlled probably from the habs for safety. Then these airships would deploy nets or grabs to the surface and collect boulders, or sand to bring up to the habitats. Surface of Venus imaged by Venera 13. This extremely hostile surface would be about 50 km below the cloud habitats. It would be possible to recover materials from the surface. 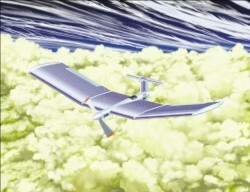 One way to do it would be to fly aerobots remotely down to as close to the surface as is safe. They would then drop nets or grabs to the surface on long cables. The cables could have balloons with lifting gas attached at intervals along the cable to reduce the tension in the whole cable. The surface boulders and sands could be dredged and then recovered to the level of the floating habitats for use for soil, extraction of trace elements and metals, and so on. It would also be possible to send hardened electrical equipment to the surface long term, with active refrigeration - this has been suggested for future Venus surface rovers. See: Beyond Earthly Skies - Cooling a Venus Rover. So the surface of Venus would be accessible to the cloud colonies as technology develops. Later on you could have mining operations directly on the surface. To start with you could get ballast and useful materials from the surface by trawling in this way much as for an ocean bed on Earth. 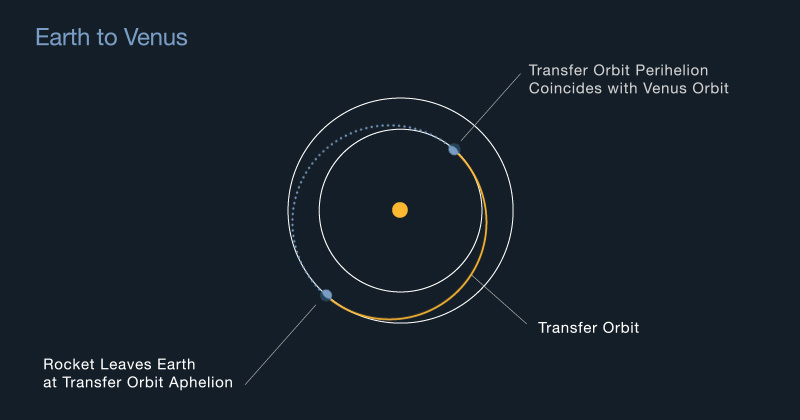 This diagram shows the Hohmann transfer orbit for Venus. You can get to Venus more quickly than Mars (5 months), you can do it more often (every 1.6 years) and the amount of fuel needed is less also. Then when you get to Venus it is easy for your humans to get down to the cloud colonies. You need no extra fuel, only parachutes and deployable balloons, similarly to the supply of materials. So, it is really easy to get to the Venus cloud colonies for a one way trip, as easy as almost anywhere in the solar system (though Moon is best for our very first colonies because it is so close to Earth in an emergency or for tourists and resupply and for short term visits). It is not so easy to get back to Earth from Venus. We will look into that under disadvantages. 10. Has a day of 4 Earth days in the upper atmosphere. That's because of super-rotation of the atmosphere which carries the entire atmosphere around Venus every 4 days. This is short enough to be reasonable for Earth life, if not quite the optimum of 24 hours. Venusian clouds (in ultraviolet). The high cloud layers super-rotate - they have high wind velocities and circle the entire planet every 4 days. This would give the cloud colonies a "day" equal to 4 Earth days. 11. Same gravity as Earth more or less. Is the only place in the inner solar system with close to Earth normal gravity already. It seems unlikely that Venus colonists would have any problems at all including normal births and upbringing of children, and Venusian colonists would be able to travel to Earth without problems to study or for recreation or whatever. This may not be such an enormous advantage - depending on future research. Humans may be able to withstand a fair amount of Coriolis force with no ill effects in rotating habs, making smaller rotating habs for artificial g possible. It might be that we only need a few hours of Earth normal g a day (e.g. when sleeping) to keep healthy in space. This is all unknown territory at present, despite all our visits to the ISS and many trips to space, there has been almost no research into effects of low g on humans or practicality of rotating tethers or spaceships for generating gravity in space (the long term experiments here simply can't be done on Earth). But does simplify construction at least if you don't need to have internal spinning habs for artificial g.
12. Protection from meteorites. Venus cloud colonies would have no micro-meteorites, a continual minor hazard for space habs. On Venus, as for Earth, these all burn up in the atmosphere long before they reach the colonies. Micro-meteorite damage to the ISS. This one was of no significance, but it is a minor hazard. Habitats in the Venus cloud colonies would not be affected by micro-meteorites - as for Earth they would be removed by its atmosphere. The atmosphere also gives protection from larger meteorites too. The Earth is hit by meteorites with energy about 3 kilotons every 1.3 years, but this is no problem because they burn up as air bursts in the upper atmosphere. The same would be true of Venus (but not Mars). 13. If the habitat is seriously compromised, it will not explosively decompress like a space habitat. Also, you won't get all the air rushing out of the habitat through even quite a small hole. Instead, as the pressure is the same inside the hab and outside, all that would happen after even quite a large hole is that the outside atmosphere of Venus would slowly diffuse into the habitat. This would give plenty of time to repair any damage. A Venus cloud colony is in no risk of exploding like this as a result of impacts - first, the atmosphere protects it from any asteroid impacts and debris up to the multiple kilotons level. Then if it does get breached, by any means including accidental collisions or internal explosions, the result is just a slow exchange of atmosphere between the Venusian atmosphere and the air inside the habitat. While a spectacular explosion of a space station may be unlikely, only in special circumstances, a space station such as the ISS would lose its air rapidly after a small breach of the skin. For example, a three-thousand cubic meter volume will decompress from 1 atmosphere to .01 atmosphere through a ten square centimeter hole in 19 hours. With a Venus cloud colony, the air would diffuse out slowly, and there would be no immediate risk of explosive decompression at all, as the atmosphere and the interior of the habitat are at the same pressure. Indeed for small holes, you might wait until you have a reasonable number of them before doing anything, schedule running repairs of smaller holes throughout the habitat. The outer envelopes could be quilt type construction, and internally compartmentalized to reduce effects of even major breach, e.g. caused by collisions with air vehicles. 14. Protection from cosmic radiation and solar radiation - the radiation protection level is RP 100 like Earth. Something close to RP 100 is probably essential if you stay in a colony long term. The levels of radiation you experience in a space walk on the Moon or in the ISS, etc can have serious health implications if you do them frequently, so in those places you would probably need to live in a habitat shielded by meters of regolith, and do most of the work via telerobotics anyway. For interesting background on all this I recommend this spaceshow discussion: Classroom with Drs. John Jurist and Jim Logan, (on radiation issues). Venus is one of the few places in the solar system outside of Earth that humans could live long term without any reason for concern about cosmic radiation or need to take special precautions or to limit the amount of EVA. Another such place would be in the oceans of one of the Moons with sub-surface oceans (which though has obvious planetary protection issues). In space habitats, shielded by tons of material, then you would be fine inside the habitat, so a large habitat such as a Stanford Torus would be fine. But you would still have to limit the amount of EVA outside of the habitat, to avoid exceeding whatever is determined to be your safe lifetime dose of exposure to the radiation. With Venus cloud colonies, this is simply not an issue at all. First, you could do a Venus One project like Mars One. Live your life out there and rely on resupply from Earth. The Venus cloud colonies do have advantage of no need to build a launch pad. Instead, you can suspend your rocket before take off using a suitably large, probably toroidal hydrogen balloon. This might mean re-engineering the rocket, and needs engineering studies. To counteract the mass of a fully fueled Soyuz - lift off mass 308 metric tons (not sure of lift off mass for the latest TMA-M), then you would need 308,000/ 1.8871 = 163,213 m3. As a bonus, if we make the torus able to expand to a larger size, like a weather balloon, then it could lift the Soyuz high into the Venus atmosphere before take-off. Anyway in short, then it seems it would be possible using hydrogen balloons to suspend the return vehicles in the atmosphere, next to the habitat. You still have the problem, how to get the fuel to Venus but perhaps you can make it in-situ using the hydrogen from sulfuric acid. Certainly we can send it as hydrogen feedstock just as for Robert Zubrin's idea for Mars with an 18 times multiplier, create 18 tonnes of fuel from the CO2 atmosphere for every 1 tonne of hydrogen sent to Mars - or in this case to Venus. You only need a rocket able to go from Venus cloud tops to orbit, rest can be done in a spaceship your crew transfer to in orbit. As for how you send the empty rocket stages to Venus from Earth - perhaps you can deliberately send spent rocket stages to Venus gradually with repeated passes of the Moon and Earth first, with gravity assist. So you just need to send one such rocket to Venus and if it is re-usable, e.g. SpaceX style, then it can shuttle up and down as often as needed by the colonists. This is just a suggestion, it needs proper engineering studies to see if this is really possible. JP Aerospace's Orbital Airship. An airship can't fly straight to orbit because if strong enough to survive the winds at low altitudes, it would be too heavy to fly to orbit. But if you put a floating staging post at about 30 to 43 kilometers above the ground, you can then have airships designed to fly in the upper atmosphere that could float at higher levels and simply accelerate slowly, until they reach orbital velocity. Passengers fly up to the orbital platform in conventional airships, then transfer to the orbital ships. These are in between a spaceship and an airship in design, and would be the largest vessels ever constructed, 2 km long (compared with 380 meters for the largest current supertankers). However, they can be amazingly light and don't need much strength, because they don't need to withstand strong winds or indeed much air at all. They would remain permanently at high altitudes. Venus airships would need a similar two stage process with the more flimsy higher altitude airships permanently stationed at a higher altitude, with passengers shuttling to them from the cloud colonies using normal airships. If the idea worked, they would then slowly accelerate into orbit with ion thrusters as for JP Aerospace's ideas for Earth. With the denser atmosphere the hydrogen would be a somewhat stronger lifting gas than for Earth. Nuclear rockets, including ones powered by nuclear reactors (maybe from materials mined in space colonies rather than on Earth), or future fusion or microfusion devices, could also use the atmosphere itself as propellant - not for combustion unfortunately - but you can heat it up in the intake, and fire it out the back of your rocket at greater speed than it came in. With a good source of energy in your rocket, the atmosphere of Venus could be your reaction mass. The advantage of this is that you don't have to carry reaction mass with you on the rocket in early stages when it is in the thick atmosphere. 2.. Not so easy access to water or hydrogen as for places with ice available. It should however be possible to get water and hydrogen from the sulfuric acid - and the habitats would be mainly self-contained cycling the water, assume by now we have mastered closed system type recycling. Once you get to the point where you grow trees to build new habitats though, that needs a constant influx of water so need to work out how to extract it from the sulfuric acid - or else import it from elsewhere. Techy aside: one idea for production of water in Venusian cloud cities. The Venus atmosphere has a sulfuric acid cycle which produces water vapour naturally. Sulfuric acid droplets fall towards the surface until eventually the water evaporates, and the sulfuric acid also decomposes, to sulfur dioxide (eventually) and water vapor. These two ingredients then rise in the atmosphere and recombine to make sulfuric acid and the cycle repeats. Perhaps by heating the cloud droplets with concentrated solar energy (solar furnaces) in the cloud colonies, and increase of pressure also if needed, we can separate the water from the sulfur dioxide in the same way to produce water for the habitats. 3. possible planetary protection issues - likely to be minor but might be major issue if it does have indigenous life from the early solar system that evolved independently from Earth. This needs detailed discussion so I'll do it as a separate section below. 4. Sulfuric acid issues - need to protect the habitats and anyone who ventures outside them. The outside of anything exposed to the sulfuric acid must be acid resistance, using materials such as lead, tungsten, teflon, or glass. Our experience of materials used in sulfuric acid plants will be useful here. See A Guide to Sealing Sulphuric Acid Plants. This of course only applies to the outermost skin of the habitat and regions likely to be exposed to sulfuric acid in case of damage. 5. high UV from the sun. SOLUTIONS: it is not hard to shield a habitat from UV or to protect from UV when you go outside the habitat. Specially coated glass for instance would do fine. 6. Venus's day even with super rotation of the atmosphere at 4 earth days is a bit on the long side. But seems reasonably survivable for Earth organisms. It seems, that the advantages possibly might far outweigh the disadvantages making it in not so distant future maybe an easier place to colonize than a space colony. The early Russian research suggests the idea of balloons filled with water, methyl alcohol or ammonia. These start off liquid, but turn to vapour through the heat of the Venus atmosphere. This gives an easy way to keep the balloon at any desired altitude. This could be especially useful for vehicles to explore various levels in the Venus atmosphere, with automatic leveling at precise heights in the atmosphere. "Calculations show that in the real atmosphere of Venus, the ultimate height, i.e. the flight ceiling for the balloon filled with water vapor, is about 39 kilometers, for a balloon filled with of methyl alcohol vapour - 45 kilometers and ammonia vapors - more than 100 kilometers." (auto translated text) See Dirigible Venus. As far as I know, there is little by way of peer reviewed studies of this idea. I can give just about the entire literature on the subject in a short list. "Rehabilitating" VENUS as a Human Destination by Peter Kokh which was published in Moon Miner's Manifesto. The earlier Russian work in 1971, see Dirigible Venus (in Russian, but you can use Google auto translate to get a rough idea of what it says). The article I used as the source of the image above, with several artist's impressions of the colonies original article (in Russian) - and forum discussion of the article. (Rough translation of the article in that forum discussion). And as far as I know, that's it by way of published literature. There is a fair amount of forum discussion but I'll give that in the next section. Venus cloud colonies have had nothing like the level of attention of Mars surface colonization. There is a small Venus Society at Linkedin of just over a dozen people. But, there is nothing remotely resembling the Mars society for Mars (headed by Robert Zubrin). So, Venus cloud colonies have had nothing like the attention given to colonizing Mars. But there are a fair number of people now discussing it in forums on-line. It is a great example I think of Science 2.0 in action. In Science 1.0 then the science is done via peer reviewed publications - the researchers may discuss it before hand of course -- but the final result is a publication in a peer reviewed journal - and that is when others start to cite your results and refer to them and so on. In Science 2.0 then much of the working out of ideas happen collaboratively over the web in forums and discussions and so on. You will get still peer reviewed papers, they have their place and are important, but are not the only way the research is done. This also helps to make it a way of doing science that permits collaboration with amateurs as well, who often come up with innovative ideas that no-one else thought of - and sharing of ideas at an early stage - and making mistakes also. You no longer have the idea that everything has to be totally worked out and polished before you share your ideas with others. So that's the spirit in which I present this article. This is a trap we can all fall into. When you are keen on an idea, then you can ignore things that are problems with it - and often don't even know that you do it. This is not just an issue for amateur theorists. There was a great recent discussion on the space show recently, where the guests raised examples of magical thinking by NASA itself. Examples include, the way NASA continued to use the space shuttle after the Challenger disaster. As with the earlier O-ring disaster with Columbia, the NASA managers got used to the foam block debris, during launch, although it was not supposed to happen according to the plans - the "normalization of deviance". This is not a scientifically valid approach. Something that works fine 20 times may fail on the 21st occasion, just through probability so you can't deduce from "it's okay so far" that it will continue to work fine. It is just human nature to tend to fall into these ways of thinking, and we see from experiences like this, that scientists can fall into these traps of magical thinking, in the same way that anyone else can. The space shuttle also cost many times more than the Saturn launcher per ton to orbit (though cheaper for return of mass to Earth). The ISS could have been built for a much lower cost using the Saturn launcher. They also cited the Constellation program - finally axed by Obama - as another example of magical thinking where the scientists involved simply hadn't done the proper sums which would have shown that it wasn't viable financially, in the view of the speakers on the space show anyway. So, we have to be aware of this when discussing topics such as Venus cloud colonies. There may well be hidden issues that we don't notice or don't give enough prominence to in our thinking. The best solution, mentioned on the show, is to surround yourself with people who are cleverer than yourself, who can correct your errors. But not to assume that they will always get things right just because they know so much, as we see from the NASA experience that clever people also are prone to magical thinking. When done well, then the science 2.0 approach can help us to avoid magical thinking. But if it turns into a flame war with the various participants sticking to their views, and not listening to each other, it can foster magical thinking. So far at least, discussions on Venus cloud colonies don't seem to have got polarized, in the way that sometimes happens. So long as participants listen to each other, and do our best to ground the ideas in the harsh engineering realities whenever we can - perhaps we can avoid the traps of magical thinking. I don't think any of those involved in this discussion are Venus colonization advocates - not in the sense of some Mars colonization advocates who have the colonization of Mars as their only goal. Nobody knows if this is really possible. It's not had any detailed engineering type review, nor has it had any detailed scientific research or experiments. But it has not had any refutations either, and it seems promising. So that is the spirit in which to take this article and the research being done on this topic, science 2.0 fashion by many enthusiasts. They do it as much for the fun ideas to explore and the interesting physics involved, as for any serious hopes that it will happen some time soon. Yet there is a tantalizing possibility that these early discussions could lead eventually to these colonies getting built at some point in the future. This is similar to the spirit with which amateur observational astronomers engage in their hobby. Astronomy is one of the few scientists where amateur observers make significant contributions to leading edge science. Perhaps you also may enjoy joining in the discussion and theoretical explorations of the Venusian cloud colonies. The idea of Venus cloud colonies is related to Buckminster Fuller's "Cloud 9" tensegrity spheres. Using his tensegrity construction methods, he worked out that you could build spheres a mile across, strong enough to withstand strong winds and storms (like his domes), yet with the total weight of the structure only a thousandth of that of the air enclosed. Heating the enclosed air just one degree above the surroundings would cause the whole structure float in the air, creating a floating city for thousands of people to live in. He didn't see this as a near future prospect, but thought it might happen in the far future. He saw the possibility of future floating cities in our atmosphere, tethered to the surface with cables, and able to be moved in response to changes of climate, etc. Project for Floating Cloud Structures (Cloud Nine), by Fuller and Shoji Sadao 1962. In practice they would probably be tethered to the ground with cables. Venusian cloud cities are similar - except that the Earth atmosphere is naturally buoyant on Venus with no need to heat it up even by one degree to stay buoyant, and no mountains you could collide with. Venus cloud colonies are like this idea except that they are naturally buoyant anyway, and can be far heavier in construction than his cloud 9, and of any size. I doubt if Venus cloud colonies in the near future could be easier to colonize than an Earth desert or under the sea. But for those really keen to start up a second home for humanity, Venus seems one of the few places you could do it. This McMurdo dry valley is far colder than it seems, one of the coldest most inhospitable places on Earth. Yet it is more hospitable than anywhere else in the solar system. Anywhere on Earth even in the harshest deserts, you can at least breath and walk wherever you like hindered only by the need sometimes for thermal protective clothing. However the Venusian cloud colonies have a lot going for them, if not as hospitable as anywhere on the Earth. The upper atmosphere of Venus is a place where you could maintain a colony with fairly low technology, at least compared with Mars and space colonies. You don't need to hold in the ten tonnes per square meter pressure of an Earth atmosphere against the vacuum of space or near vacuum of the lunar or Martian "atmosphere". You are not critically dependent on machines for temperature regulation. You do need oxygen, but once we master closed habitats like Biosphere 2, then this can be supplied using plants and algae. Venusian cloud colonists may well be able to survive at least for a while without any higher technology at all, just life processes, even for repair of their habitats, and for EVAs, they can do fine with relatively low tech. air breathers and protective clothing. It is hard to imagine a cloud colony working totally without technology but the demands are less than for other space colonies. A well established self sustaining colony in the Venusian clouds could continue fine for quite a while even if all the machines it uses break down. So, especially if you can generate the oxygen for your habs with plants and get life based solutions for extracting the water from the sulfuric acid, etc, it seems a hospitable place. It is also stable long term, and resistant to changes introduced by humans as far as we know. Venus is not going to lose its atmosphere in a hurry or go snowball Venus or anything like that . The Moon surely would be the location of our first colonies, or in orbit close to the Earth, for emergency support if nothing else. I am personally totally skeptical about any plans using present technology to try to colonize anywhere in the solar system, anything like permanently, with travel times of months to get there and 30 minute plus light speed delays. Even the Venusian cloud colonies, I think would surely fail in some Apollo 13 type disaster, with death of the colonists, if attempted today. That's because so far we haven't yet demonstrated the ability to create a closed habitat that can be sustained and repaired long term without fast and easy access from Earth. But longer term, Venus may seem quite promising. The main issue to be tackled for early colonists would be, to develop the ability to live in an almost closed habitat (though with arguably better resource opportunities than most other locations) and then, you also need a way to return to Earth - unless you are keen on the Venus One idea. The ideas sketched here are suggestions for some future period, perhaps a decade or more into the future, when we have the necessary technology and experience to consider permanent colonization in places further afield than the Moon. Some ideas can be sketched out, as above, but really, this needs detailed study and assessment if the idea is going to happen in the near future. Next, I'll talk about ideas for terraforming Venus, which is worth thinking about because things we do now could impact on future possibilities for terraforming Venus. But first, it's a good time to think some more about magical thinking, with a word of caution on these types of propjets. One other good example of magical thinking not mentioned in the show, I think are all the ideas for terraforming, whenever they are described as projects we could start on right away. When we have the technology to put giant mirrors and shades into space to cool down Venus and create an artificial sun with a 24 hour day – or to warm up Mars – then we would surely by then have completely solved the Earth global warming problems and energy issues. That’s because it would then be a simple matter to collect all the power we need as solar energy from similar giant mirrors around the Earth – or solar power satellites around Earth – and beam it back to Earth. Similarly when we have the technology to turn Mars or Venus into a second Earth with all the cycles working perfectly – using the same technology it would be an utterly trivial matter to keep Earth well adjusted so that its CO2 levels do not increase by the tiny fraction of a percent causing our current global warming issues. The CO2 concentration in the atmosphere is only 0.04% (400 ppm) and a change in that concentration is enough to cause global warming issues on Earth, which with all our technology, and our billions of people, we still have problems dealing with. So to think that with our current knowledge and technology we could hope to adjust and keep the desired levels of all the gases in a terraformed planet with a few colonists, located at a five or six months journey from Earth, is, I think, a fairly extreme case of magical thinking. So both those ideas are for a future solar system where huge mega-engineering projects are the norm. By the time it is easy to put giant mirrors into space, we may well have fusion power for instance, as it seems only a decade or two ago – possibly also micro-fusion plants using the likes of the Polywell and other ideas for micro-fusion if any of the current plans work out. As that technology matures, we can easily create artificial suns anywhere in the solar system and who knows what else we can do. The magical thinking there is to suppose we can do such projects right now with present day technology and at an affordable cost. Or that we have the knowledge and understanding to start right away on a project that requires that level of control and technology to succeed. It is a lot of fun to think about such projects right now, and we might sometimes be on the right lines with our thinking. It might also help us to avoid some of the things we could do wrong now, which could impact on future possibilities like this. But to think that we know enough to start on such a project right away - that I believe takes us far into the realm of magical thinking. Venus is one of the planets that could be terraformed to resemble Earth. Indeed it has about the same quantity of CO2 as the Earth (See Earth's atmosphere before the Dinosaurs). The difference is that most of our CO2 is locked up in limestone and other carbonate rocks. It also has no continental drift, as the continents are all "stuck" - and instead has a global resurfacing upheaval every few hundred million years. But this may be due to lack of lubrication by water, so if we were to add enough water to Venus, it might be enough to restart continental drift. That's not certain as its lithosphere is also thicker than the Earth's but is a possibility. Artist's impression of Venus if it were terraformed (Credit Daein Ballard), who writes: "Notice the interesting cloud formations and that the planet has polar caps. I decided to show the planet this way after studying Venus' atmosphere. The two Hadley cells the planet has stop at 70 degrees north and south. So the polar regions are cut off from the warm air. Also the slow rotation of the planet causes the clouds to whip around the planet very fast, especially at the equator, to balance out the temperature difference between day and night sides of the planet." This all requires mega-engineering and would be surely a multiple centuries and probably multiple millennia long project. But still, it seems worth thinking about, could our activities such as cloud colonies on Venus cause any problems for future terraforming, and if so, does it matter? Its main disadvantage for terraforming is its long day (also probably strong winds from day to night side). One idea is to have mirrors in space that cause a simulated sun - shade out the sunlight on the day side at "night" and shine extra sunlight towards the surface as required, from orbiting mirrors - simulating rotation of the sun around the planet every 24 hours. Or it could be solved at ground level by using shades and artificial light. Or life just adapts to the long nights, after all some life on Earth already copes with the month long nights of Antarctica and the polar regions. Another issue is that it has lost nearly all its water to space. There is enough for cloud colonies to extract it, but not nearly enough for a planet with rivers, lakes, and seas. The usual solution here is to arrange for comets or icy moons to collide with Venus (using some of the ice as the reaction mass, as well as gravity assist, to direct the ice to Venus). Note that Paul Birch in his Terraforming Venus Quickly suggests that Venus could be fully terraformed over a period of a couple of centuries, from 2040 to 2250, and has put forward a step by step plan with costing, which he believes would work. In his final vision for the planet then he has a simulated sun, with mirrors in space. Cooling of the planet is accomplished using a sun shade in space. and he has cloud colonies, which gradually float lower in the atmosphere as the atmosphere cools down. Venus doesn't seem anything like as troublesome as Mars, in the Trouble with Terraforming Mars. For instance its orbit is near circular, and its axial tilt is minute, so it doesn't need a stabilizing Moon. If the Venus atmosphere has billions of people in cloud colonies, then this makes some solutions such as impact of comets to add water more troublesome. as a hazard to the cities. Venus would have a long day length after terraforming - without the upper atmosphere super-rotation. This seems only solvable via mega-engineering - such as the Soletta mirrors in space - or via artificial lighting - or use of life forms that can tolerate half Earth year long "nights". As for Mars you might want to introduce life in a slow succession such as cyanobacteria first with no aerobes. The life introduced in the cloud colonies could interfere with this. Again, as for Mars, we don't have any experience of terraforming and so can't know what the end state would be for sure. There may be alternative end states not desirable for human colonization, e.g. with atmosphere poisonous for us, reinforced by life processes or inorganic cycles, which may be hard to avoid during terraforming. Study of exoplanet atmospheres may eventually give us good ground truth for this. Venus's magnetic field is too weak to prevent hydrogen from getting stripped from its atmosphere. So, unlike Earth, a terraformed Venus would lose water constantly through solar wind interactions. It also has nothing like enough water to get started. As with plans to terraform Venus, I think that any detailed ideas about how to do it, so including Paul Birch's are likely to be oversimplifications. For instance, he has the CO2 / N 2 atmosphere transformed to an atmosphere with oxygen and naturally stabilizing in 40 years with 24 hour sunlight from the orbital mirrors. This seems possibly optimistic to me, given that Chris McKay estimated 100,000 years for the same process on Mars. Perhaps if we can make sure there are no aerobes or other forms of life to interfere with the process? Then, how do we know, if it works, if a planetary atmosphere can indeed change so rapidly, in just decades, due to influence of life forms - that you end up with an Earth like climate at the end? Life can't be controlled so easily I think and if it goes wrong and you find it headed for some other end point, what do you do, with a whole planet to adjust? We have trouble enough on Earth making small adjustments to the levels of CO2 in the atmosphere. This is also surely an issue for longer term terraforming over millennia. We have no experience of terraforming anything, or even of closed system habitats in space. We have only limited experience of working to help keep the Earth climate stable, in response to our technological changes to the planet, and so far with limited success. Earth took billions of years to reach its present cycles and climate. It might be possible to speed that up so it only takes thousands of years., but we can't know that for sure with our present limited knowledge. Also we see from Venus that there is not only one possible end state for a planet like Earth. There may be many other possible end states, only a few of which are hospitable for humans. It might be a tricky job to steer the process of terraforming to the desired end state. Since we have only had reasonably advanced technology for a century or so, we also have no previous experience of technological millennia long commitments, or even two century long technological commitments as in Paul Birch's idea, if it was feasible. We do not know for sure that technological civilizations themselves can be stable over such time scales. Hopefully they can be, but I think we need a few more centuries of stability before we can realistically take on a project that requires stability of our civilization for centuries or millennia to be carried out successfully. Knowledge we gain from exoplanets could help here, also our experience of building larger and larger enclosed habitats in space. Also if we ever are able to contact other long lived extra-terrestrial civilizations then their experiences of terraforming may also help a lot. We do however have some ideas for a gentle transition from floating cloud colonies on Venus to a terraformed Venus, and there seems on the face of it at least to be far less danger of messing up the process of terraforming than for Mars. So perhaps we could get started on floating cloud colonies before we can see the way all the way to a terraformed Venus or even know if that is a desirable end goal. But there is enough of a danger to make it important, I think, that any current ideas should be open ended. I think it is best that we don't make any irreversible decisions for some time yet, even the cloud colonies if they could lead to an irreversible change - until we have had time to study Venus and also give more thought to possible future issues for Venus. Venus has so much CO2 that even if you could somehow project all of it into space, it remains within the gravitational influence of Venus, and the planet would just gather it all up again and be back again where you started. Paul Birch and others suggested turning it into carbonates as for Earth, since Venus doesn't actually have significantly more CO2 than Earth, it is just that it has it all in gaseous form. Perhaps another approach though, is that you could fire the atmosphere of Venus to Mars, using a railgun or similar, as a stream of dry ice pellets enclosed in reflective wrappers to protect them from the sun's heat, thus making both planets habitable in a single project. But that is a far future idea, and verging on science fiction, at least at present. Artist's impression of mass driver for lunar launch. The same technique could be used to fire the Venus atmosphere into space as dry ice pellets. In the far future maybe you could send the dry ice to Mars so terraforming two planets in one go if thought desirable to do. It could also be useful for exports of materials from Venus. Mass drivers have been suggested as a way to supply fuel and other materials to Earth orbit at low cost, the same could be used for Venus for export of valuable commodities, for instance Nitrogen from its atmosphere - with 3 bars of nitrogen, it has enough to spare to be useful for early space colonies (nitrogen is rare in asteroids). James Oberg in his 1981 book, New Earths, looked at a similar project, this time scooping the atmosphere from space with spaceships and scoops on cables. "If we wish to remove 98% of the mass of the Venusian atmosphere in a reasonable time, say, 100 years, we must haul up a mass 10 quintillion tons, or 300,000 tons per second. Compare that to the flow along the Amazon river...10,000 tons per second. The largest machines built which handle flowing water, like the Niagara power project, handle 400 tons per second. Or look at it from an energy requirement: hauling the mass of gas 100 km high, and then accelerating it by 20 km per second requires about 1025 ergs over a 100-year period. That's all the sunlight falling over the same period on an area of 10,000 square km assuming 100% efficiency of conversion. Throw in a factor of 10 for engineering reality, and the fleet of air scoopers must have solar collection panels of 20 million square kilometers, which is three times the total area of Venus. Let the engineers of the next century concern themselves with the building of such super-scoopers!" One idea that's been suggested is to transform Venus just enough to make the upper atmosphere more habitable for humans, by reducing the sulfuric acid levels. The idea would be, to redirect comets or icy moons from elsewhere in the solar system to impact into the Venus atmosphere. It might also happen naturally, if you have cloud colonies there already, importing water from the rest of the solar system. The water would dilute the sulfuric acid and eventually Venus might have similar levels of water in its atmosphere to the amount of water in the Earth atmosphere. This would need to be an on-going process if continued over geological timescales, replenishing with more comets from time to time, because the water would get lost gradually from the upper atmosphere due to the lack of magnetic shielding from the solar wind. If we could increase the oxygen levels in the atmosphere - again this is compatible with the larger cloud colonies. Large cloud nine type habitats would easily float at an Earth normal atmospheric level even if the atmosphere outside began to approach Earth normal levels, because of the temperature differences inside due to human activity - just as for Cloud Nine. A problem here though is that carbon dioxide is poisonous to humans, so even when there is enough oxygen in the atmosphere to breath, yet, we also need huge quantities of a buffer gas such as nitrogen also. Probably nothing much short of full terraforming of Venus would make the atmosphere breathable by humans. Again this is a far future possibility at least for present day technology - but more achievable than full scale terraforming of Venus. There is a small chance of life in the Venus clouds. The atmosphere is out of equilibrium with both H2S and SO2 which life could use as a source of energy. Life could have evolved on its surface in the early solar system, or was seeded by Earth or Mars life when Venus was young and habitable on the surface. If so, it might migrate up to the clouds and over billions of years it could adapt to the conditions there as the surface became more hostile to life. If so, it might still be there. Some time back, a team of scientists for COSPAR examined the situation for Venus and came to the conclusion that even if there is life in the cloud tops, conditions are so different from Earth conditions that there is no need for planetary protection, mainly because of the sulfuric acid in the clouds. They classified it as Category II meaning that you simply need to document whatever it is you do. However, there was a dissenting voice at the time, by Dirk Schulze-Makuch who was not part of the team. See Planetary Protection Study Group Mulls Life On Venus. That gives room for discussion, about whether the classification might need to be re-examined. If it was classified as Category III / V that would mean we have to take care and sterilize any probes that visit Venus and also take extreme care for any samples of the Venus upper atmosphere returned to Earth. The plus side is that if we do discover life in the Venus clouds, it has most likely evolved separately from Earth for billions of years - a very exciting discovery - and we should of course take care in such a situation. There seems no hurry to get started anyway. We can afford to take our time and do things properly. Colonization of the atmosphere of Venus, if it happens, is a long term process. It might lead to terraforming Venus, if so that is likely to be a multiple millennia process - and even in Paul Birch's massively speeded up mega-engineering version of terraforming Venus, which may be over optimistic, it takes at least two centuries to complete. There is no hurry about all this, we can afford to spend a few decades studying Venus's atmosphere carefully, and deciding what we want to do. We are not ready to colonize anywhere outside the Earth Moon system anyway right now, in my personal point of view. This is my own view on the matter for discussion. You may have your own ideas on all this. Do discuss this in the comments section of this article. So anyway, as a suggestion, we could explore Venus from Earth using autonomous robots, sterilized to start with until we understand what is there better. The cloud decks are probably less complicated than Martian terrain, so they may not involve much decision making. Certainly they are easier to navigate, as there is no risk of collisions. So, we might not need to send humans there, for scientific study, or to navigate the probes, at the cloud top levels anyway. At least the need for humans for exploration of Venus is far less than for Mars. Idea for a Venusian solar powered airplane. (See also, Atmospheric flight on Venus). This could cruise permanently on the sunny side of Venus, and would be more maneuverable than a balloon or dirigible. One way or another we may be able to explore the Venus atmosphere in an adequate preliminary way using autonomous robots. There are no obstacles needing real time action by a human pilot (e.g. via telerobotics) so they may be able to fly quite fast under auto pilot. Certainly it is easier than Mars which needs highly advanced autonomous robots, or else telerobotic control from orbit, for adequate exploration in a reasonable period of time. But there may be some advantages to humans close up - e.g. to sample niches in the clouds that are different in composition - or for decision making during the experimental procedures. So, depending on what we find, perhaps we might send humans to Venus in the early stages. If so, if we still want to keep the clouds pristine, they can go to orbital habitats and study the clouds via telepresence. Finally if it becomes reasonably conclusive that there is no life there, can start to think about possibilities for the cloud colonies. These colonies are not needed for scientific exploration, at least in the early stages. Whatever we find there, we can explore Venus adequately from orbit via telepresence. Orbital satellites can easily get close enough to Venus for telepresence operations of probes in the clouds or rovers on the surface. It's often said that we need to colonize the solar system in order to avoid potential disasters on the Earth. But it is hard to think of any scenario where this would be a useful thing to do in the near future. Perhaps a black hole that destroys the Earth - but if there are as many black holes around for that to be a possible scenario, we should see stars blinking out, and it would be a miracle that our sun has survived so long, since stars are much bigger targets than planets. It would be more likely for our sun to blink out, and then no space colony would be immune from its effects, at least, not with current technology. Or a truly enormous asteroid impact. But those only happened in the early solar system. There are no signs of impacts large enough to make an entire surface molten in the recent geological past. Or a gamma ray burst - but that would leave many survivors on the Earth, on the other side from the blast and underground or under the sea. And all these are exceedingly unlikely to happen in the next few centuries. If we see some imminent disaster unfolding, with a few years warning, then we could do something at that point. In the 1970s, they calculated that we could build a Stanford Torus for about ten times the cost of the Apollo project. With present technology presumably it would cost far less, so that would be one possible lifeboat we could build, with some chance of surviving. After any normal disaster such as a huge asteroid impact like the one that brought an end to the dinosaurs (again highly unlikely to happen in the next century or so), Earth would remain by far the easiest place in the solar system to rebuild. It's air is already breathable. If there were any astronauts in space at that point, their best hope for survival would be to return to Earth and help with the rebuilding. And the best we can do right now is to prevent those disasters from happening, e.g. with space guard. Not that we shouldn't colonize outside of Earth. Just that there is no great urgency to do that for survival of humanity, in my view anyway (for discussion again). Even immediately after an asteroid impact like this, Earth would remain far more habitable than anywhere else in the solar system for humans. After a disaster like this, if there were any astronauts elsewhere in the solar system, the best thing they could do is to return to Earth to help with the rebuilding here. If there is interestingly different life there, let's celebrate it, and put off plans for colonization for a few decades or centuries, until we find out what it is, or are able to simulate / study it with reasonable confidence. We could still colonize a Venusian cloud layer with life, depending on what we find, for instance, if confident that Earth and Venus life can co-exist without harm to either (this is possible if they occupy different regimes and neither can occupy the habitats occupied by the other). In this Venus is no different from Mars, Jupiter, Mercury or even the Moon. I think at present we simply don't know enough about our solar system to start making long term plans for colonization or terraforming. Instead we need small research stations like for instance the ones in Antarctica, also can send human explorers, like the early Antarctic explorers to the solar system so long as they are careful to keep it clean and explore in a biologically reversible fashion. I think the exploration of Antarctica is a far better analogy for present day solar system exploration than the colonization of e.g. N. America or the Polynesian islands. Simply because space locations we can visit are so hostile, more hostile than Antarctica. 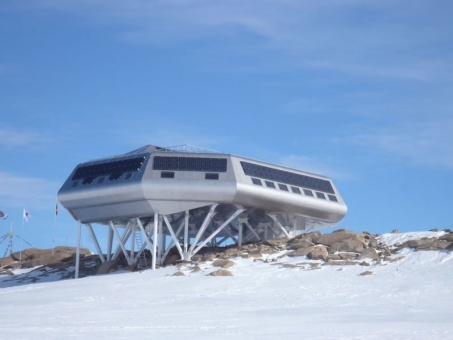 The Belgian Princess Elisabeth Antarctic Station - this is the first Zero emission Antarctic station - it generates all its own power through green energy sources such as solar and wind power. At the present state of knowledge of the solar system, and the present state of our capabilities for closed system habitats, and the harsh hostile conditions in all proposed locations for space colonization compared with Earth, then Antarctic stations are a better analog than any historical colonizations such as of the Polynesian Islands or the Americas. Early settlers to these places did not have to mine for ice to get water, or ship it in as ice, or extract it from sulfuric acid in the atmosphere, or extract oxygen for breathing from water or other sources. They didn't need to worry about whether the air was breathable and indeed most of them took this totally for granted. Venus cloud colonies are perhaps the most hospitable places in the solar system according to some measures. Far more hospitable than Mars, I'd say, and more hospitable than the Moon also though not so close to Earth or so easy to return to Earth from. Still, none of these places are anything like as hospitable as Antarctica where you can at least breath. Venus cloud colonies might perhaps be comparable to ideas for sea bed habitats on Earth, however - if the water supply and easy return of colonists to Earth issues can be solved. If so they are far more hospitable than Mars or the Moon, and may be our best bet for a second home for humanity in our solar system. We should however bear in mind that there have been almost no peer reviewed studies of this, just two papers in recent years. So it is necessary to keep an open mind about it. It is surely too soon to come to a final conclusion one way or the other. First, if there are any mistakes at all in this article, please don't hesitate to correct me in the comments. This is the spirit of Science 2.0, the more eyes you have on it then the better chance of spotting mistakes. Also if you know of anything I haven't covered, again do say in the comments. I can still edit the article and correct mistakes, and of course also visitors to this page will see your comment. If any of you is a native Russian speaker, it would be great to have better translations of the Russian material. Some of it is a little hard to understand in the present translations. Do share whatever else you have on your mind related to the article. Also, please don't feel that you have to keep totally focused on the topic of the article, is okay to wander into other topics during the discussions. I only delete obvious spam comments, as you'll see from some of the comments to my other articles. Do say in the comments if you know of other places with active wide ranging current discussions of Venus Cloud Colonies! Most of my other articles are about Mars. However some of the issues raised in them are also relevant for Venus. Also you might like to read these if you think that Mars is the best choice for a suitable second home for humanity. It is natural to think that, since Mars is often suggested as a good place to colonize in news stories. However, if you read the articles, you may see things a little differently. It is far more hostile to most Earth life than the harshest deserts on Earth, and is likely to stay that way for centuries. Also there are many issues that could arise in any centuries and millennia long project to terraform it. If there is Life in Venus Cloud Tops - Do we Need to Protect Earth - or Venus - Could Returned XNA mean Goodbye DNA for Instance? Could Microbes Transferred On Spacecraft Harm Mars Or Earth - Zubrin's Argument Revisited - though it is unlikely that Venus and Earth shared microbes for the last few billion years, still, they might have shared life in the early solar system - and indeed, Mars and Earth also are most likely to share microbes in the early solar system during the late heavy bombardment. Imagined Colours of Future Mars: Should We Treat a Planet as a Giant Petri Dish? (Kindle). Would Microbes From This Astronaut Make It Impossible For Anyone To Terraform Mars - Ever? - problems that may follow from introducing life to a planet in an unplanned way - this could also be an issue for terraforming Venus using ecopoesis - if you expect the life you introduce to create an oxygen atmosphere for instance. This is relevant because Mars is often cited as a possible second home for humanity. Also, as I said above, though perhaps we might not mess up Venus as badly as Mars by colonizing it without much forward thought about the possible consequences, yet, what is the hurry to colonize Venus either? So,some of the same considerations apply to Venus as for Mars. Space Habitats For Colonists - And Contamination Free Boots On Mars - With Telerobotic Avatars - we could use the same methods for Venus in the very early stages, if it was necessary to keep the upper atmosphere free of Earth life - and also because of practical issues of return of humans from Venus cloud top levels. So again there are close similarities between Venus and Mars exploration in the early stages - though with Venus we can probably explore the cloud tops at least more easily with semi-autonomous robots, since there are no hazards by way of terrain to navigate in real time. Asteroid Resources Could Create Space Habs For Trillions; Land Area Of A Thousand Earths - suggests that long term, resources from the asteroids used to build habitats are more likely to be humanity's second home than any planetary or moon surface colony.